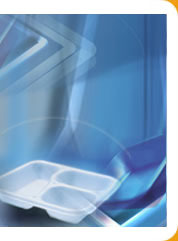 For the trays we offer two closure options: Hot sealing with film / foil or alternatively the showcase lids. ALX sealing film / foil is suited especially for the ALX sealing system. Whether using the transparent film or the aluminium foil, both will seal our trays to keep the food fresh and shuts the tray tightly. The easy-to-handle-packaging for fast food, made of heat insulating EPS and available in different shapes and colors. Besides the standard range of products we are capable to produce custom made packaging. All ALX machines are designed for long term applications approved by thousands of satisfied customers for more than 25 years! Participate in the patented ALX system for an economical way of starting up in the HMR. For transportation purposes of several hot or cold meals packed in ALX trays. The boxes are available in a broad range of sizes.